4.5 stars from 1034 reviews. These collated alpha tabs for exhibits in legal departments of large corporations, law libraries, litigation firms and government agencies are a great way to organize documents. • First bank has letters from A-J, the second bank has letters from K-T, and the third bank has letters U-Z. • Avery style characters are the most common and great for easy viewing. 80# thick standard sheet size 8.5" x 11" with a .5" side tab. Avery style tabs feature 14 pt. Helvetica Bold font with upper case letters. 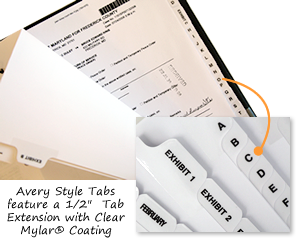 Tab extensions are printed with black ink and laminated with clear Mylar for added durability. 25 sheets per set, minimum order of 50 sets (1,250 sheets total). Avery style tabs feature 14 pt. Helvetica Bold font with all upper case letters. Tabs come with Mylar Reinforced Binding Edges. Tabs are 3-hole punched and have Mylar Reinforced Binding Edges.